NEW YORK, NY.- Christie’s Impressionist and Modern Art Evening Sale achieved a total of $102,767,000/£68,511,333 /€77,268,421 for paintings and sculpture with top lots from Pablo Picasso, Alberto Giacometti, and Tamara de Lempicka commanding the highest prices. A new world auction record was set for Tamara de Lempicka’s Portrait de Madame M. from 1932 for $6,130,500. 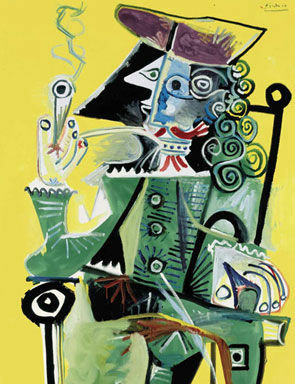 Pablo Picasso (1881-1973), Mousquetaire à la pipe, oil on canvas, 57 5/8 x 35 1/8 in. (146.5 x 89.3 cm.) Painted 17 October 1968. 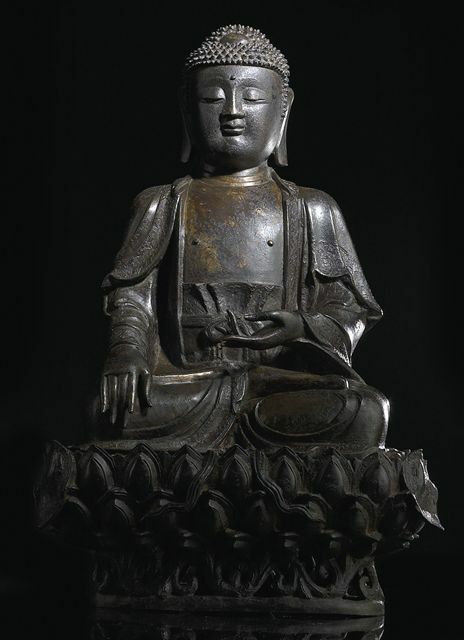 Photo: Christie's Images Ltd. 2009. 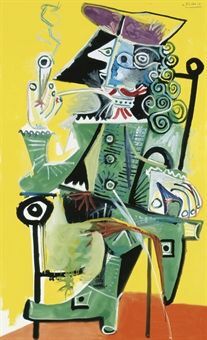 Pablo Picasso's late period Mousquetaire à la pipe from 1968 was the top lot of the evening, selling for $14,642,500 million. The vivid, full-length image portrays the artist in one of his favorite guises: the brave and adventurous musketeer with long, wavy hair, clad in doublets and ruffled collars. The second highest lot for the evening, equally vivid in palette, was Picasso's late period Femme au chapeau from1971 which fetched $7,754,500. This iconic portrait was hand-selected by Picasso for inclusion in his second solo exhibition at the Palais des Papes in Avignon, France and had been a centerpiece in the private collection of the artist and Oscar-nominated film director Julian Schnabel since 1989. Alberto Giacometti (1901-1966), Buste de Diego (Stele III), signed 'A Giacometti' (on the back of the sculpture); numbered '1/6' (on the top of the pedestal), bronze with brown and gold patina . Height: 65¾ in. (166.8 cm.) Conceived in 1957-1958 and cast in 1958. Photo: Christie's Images Ltd. 2009. Works of high quality and prestigious provenance performed exceptionally well. 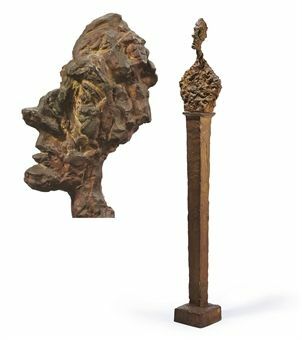 In keeping with Christie’s recent strong sales for Alberto Giacometti’s sculptures – including a world auction record set in May 2008 for Grande femme debout II – the artist's Buste de Diego (Stele III), a rare full-size bronze bust balanced on a tall, narrow plinth, sold for $7,698,500. This work was fresh to the market, having been acquired by the Gimbel family in 1959, the year after it was cast. The two other works offered from this collection also performed well. Matisse’s Nu à la serviette blanche, an early figure painting that captures the artist at a moment of bold innovation fetched $3,218,500, along with a unique study by Joan Miró. 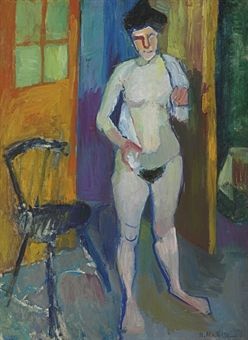 Henri Matisse (1869-1954), Nu à la serviette blanche, signed 'H. 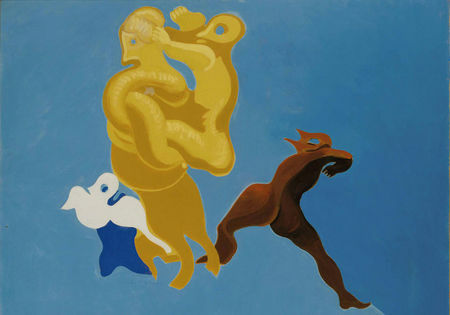 Matisse' (lower right), oil on canvas, 31 7/8 x 23¼ in. (80.7 x 59.2 cm.). Painted circa 1901-1903. Photo: Christie's Images Ltd. 2009. Tamara De Lempicka (1898-1980), Portrait de Madame M., signed 'T.DE LEMPICKA' (upper right), oil on canvas , 39 3/8 x 25½ in. (99.5 x 64.8 cm.). Painted in 1932. Photo: Christie's Images Ltd. 2009. 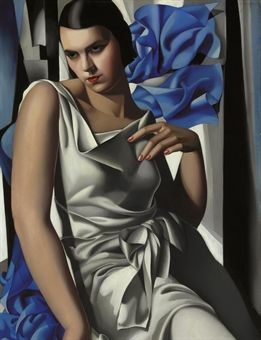 The seductive Portrait de Madame M. by Tamara de Lempicka set a new world auction record for the artist when it sold for $6,130,500. As one of the last of the large portraits Lempicka completed on a commission basis, Portrait de Madame M. is an exquisite swan song. A second work by the artist, La Chemise Rose I from circa 1927, achieved $3,218,500. 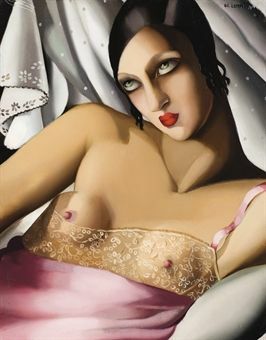 Tamara de Lempicka (1898-1980), La chemise rose I, signed 'DE. LEMPICKA' (upper right), oil on panel, 16 1/8 x 12¾ in. (41.1 x 32.5 cm.). Painted circa 1927. Photo: Christie's Images Ltd. 2009. Alexej von Jawlensky (1864-1941), Odalyske, oil on board, 26¾ x 39¼ in. 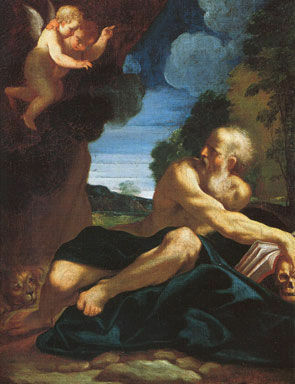 (67.8 x 99.9 cm.) . Painted in 1910. Photo: Christie's Images Ltd. 2009. 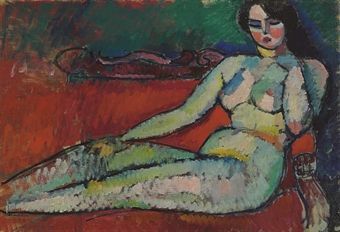 Another top lot of the evening was an exceedingly rare Odalyske by the Russian born painter Alexej von Jawlensky, which achieved $5,122,500. 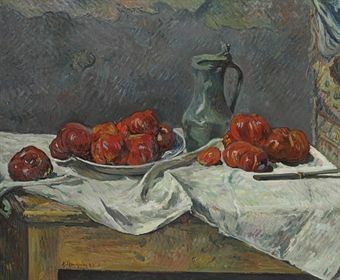 A sublime work by Paul Gauguin, Nature morte aux tomates from 1883 exceeded its high estimate and sold for $2,882,500. 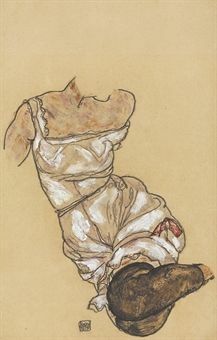 Strong prices were achieved for works on paper by Egon Schiele. 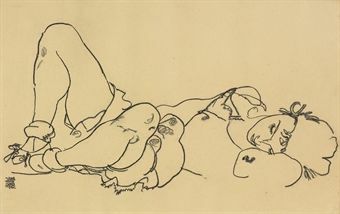 The artist’s Wieblicher torso in unterwäsche und schwarzen strümpfen, from 1917, one in a series of studies of a young red-headed model achieved $602,500; and Liegende from 1918, a reclining figure drawn with great economy of line in black crayon on paper, soared above its estimate of $200,000-300,000, selling for $746,500. The spring sales season continues at Christie’s New York tomorrow, May 7 at 10am with a sale of Impressionist and Modern Works on Paper and Day Sale.